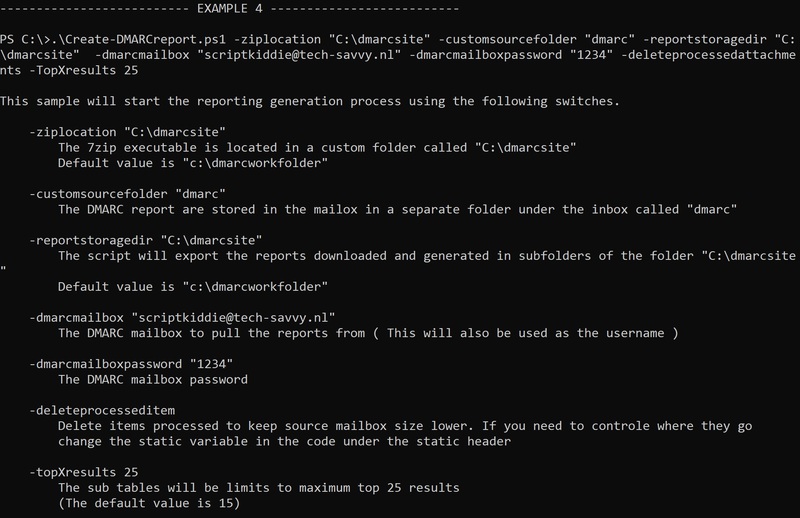 Today I am releasing the DMARC monitoring tool to the community. It has been in development over the pas few weeks and is now ready to be used. This Report tool will give you detailed insight into domains that are trying to spoof your owned domains, subdomains or even non existing brand names. As this can cause damage to your domain / company in many ways it is interesting to implement DMARC reporting or better blocking policy’s. In my next blog series I will start explaining on how you get to DMARC reject policy from both a technical and a functional perspective. With DMARC you can gain inside into detailed reports but there are no free tools to generate nice reports from the emails generated by DMARC. This script will provide exactly that functionality as it is a end to end solution publishing the new generated reports as HTML files. If you configure the script to push the HTML files directly to your webserver you get a instant report page on your intranet. The script has a lot of flexibility to run with different parameter but the main functionality is described below. To view the entire parameter set you can user the Get-help function of PowerShell or look at the synopsis of the script. Each successfully downloaded item will then either be moved or deleted from the source mailbox. From the new database file the script will generate 1 overall HTML report page and per month HTML report sub pages. HTML reports will be tabbed separated in the report HTML files for easy overview per domain. Finally a IP to hostname table will be added for a additional overview. The script has been designed to run as a scheduled task in a daily routine so the current months data is always up-to-date. To further facilitate scheduled task runtime the script supports a secure password function to use a different account credential for the mailbox than the one the scheduled task runs. Please leave me any comments or rate the script on TechNet if you like it. If you found any bugs or want to suggest additional features you can contact me via contact@tech-savvy.nl. In my next blog post sessions I will start to show how to gain maximum benefit out of SPF, DKIM and DMARC for your reporting and how to run a project to implement DMARC as I know a lot of admins are struggling to implement it from a functional perspective or not all impact is known. Great stuff, but i’m struggling with PowerBi. Do you have small example of how you created the filter in PowerBi?